A wrap up of all the games we played in Prague – ten companies, 13 venues, 25 games. In summary, an excellent city to visit both as a tourist and as an escaper with quality games in a variety of interesting themes and particularly impressive for beautiful games. 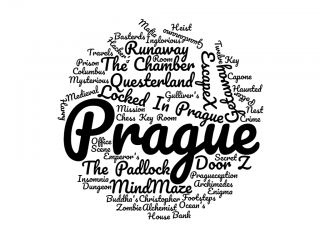 One of the high end escape venues in Prague, Questerland has three quality, beautiful games. Zombie is logical but relatively short and straightforward, Harry Potter has some slightly harder parts but is still relatively easy. while The Bank Heist is probably the harder of their rooms but has a couple of weak puzzles.